After the home is framed and sheathed with particle board, the particle board has to be protected. House wrap, or tar paper was used in the past, covers the entire outside of the house. The wrap provides extra insulation and makes the home watertight for the most part, but needs to be covered and protected. At this point, brick, wood panels, aluminum or vinyl siding can be applied. Vinyl has proven itself to be the most valuable when considering “bang for the buck” and it’s appearance, durability and function when compared with other materials. Cosmetic value of siding is a personal choice, but there are some standard design concepts that universally apply. Wood siding requires constant ongoing maintenance with painting or staining and insect treatment to prevent rot. Bricks don’t off the same types of problem, but are very expensive. Aluminum siding is comparatively inexpensive, but most people don’t think it looks very nice as it doesn’t maintain its appearance over the years. Vinyl siding is different from the other options because it has a relatively low price to suit any budget while keeping its shape and appeal for decades without requiring any maintenance other than an occasional spray cleaning. Installation is quick and doesn’t require many specialty tools as the panels click together and nail to the side of the house; similar to a roofing system each piece covers the nails of the piece below it, providing strength and durability with a finished look. Insulated wall systems have also been making great strides in popularity in recent years. They are essentially vinyl siding, but with additional layer of contoured insulation to raise the wall’s r-value. The extra insulation is a crucial money saver for homes in the cold northern states to keep the heat inside and the weather outside. It also helps keep down the price of heating and air conditioning in homes in the more temperate weather of the southern states against the winter nights and summer heat. 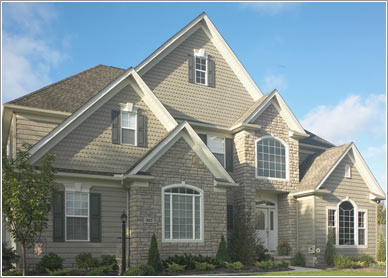 Siding is an important decision, as no matter what you choose it’s going to define the look of your home. Whether it’s going on a new home or as part of renovations, siding is what everybody sees and what you’re forced to look at for years to come. With the advice from a professional at Window World, you can make an informed decision you’ll be happy with as part of your home design and as protection for the investment value of your house.